Performers include: Blake Anderson, Adam DeVine, Anders Holm, Maribeth Monroe, Jillian Bell, Erik Griffin, Waymond Lee, and Jesse Hudson. This comedy TV series follows three former college roommates who, as they transition into adulthood, continue to party, drink and play pranks after dropping out. Blake Chesterfield Henderson (Blake Anderson) is the most zany and eccentric of the trio but can also be the most sensible. Very narcissistic, Adam Dwanye DeMamp (Adam DeVine) is impulsive, impish, immature and fun-loving. He also has some anger issues. Meanwhile, Anders “Ders” Holmvik (Anders Holm) is the most responsible but is naive and can be easily misled. They live together and share a cubicle at a telemarketing company called TelAmeriCorp. Adam finds their foul-mouthed boss, Alice Murphy (Maribeth Monroe), attractive and Jillian Belk (Jillian Bell) is her socially inept assistant. Montez Walker (Erik Griffin), Waymond Womano (Waymond Lee), and Jet Set (Jesse Hudson) are co-workers in another cubicle. First aired: March 15, 2017. What do you think? 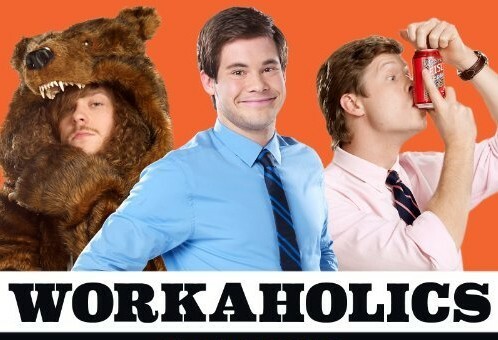 Do you like the Workaholics TV series? Do you think it should have ended or been renewed for an eighth season? Workaholics: Comedy Central Series Reportedly Ending; No Season Eight? Funny show,add a little more of other characters on to spice it a little more. Hopefully other t.v. station can pick it up..
Its starting to wear out. Unless they do something to keep up my interest is evaporating. Yes they need to get rid of the two main actors, Rach and Victor.